Welcome to our online exhibit about the history of the Smithsonian and postcards! In this exhibit you will find the history and evolution of postcards at the Smithsonian, general postcard history, and a guide for dating postcards. In addition, the image galleries contain over 100 selected postcards of Smithsonian museums, Washington, DC, and other Smithsonian-affiliated places. The Smithsonian postcard has undergone major changes between the advent of postcards and today. The evolution of the postcard at the Smithsonian, illustrated by its purpose and usage, shows how the Institution has expanded throughout its existence and reached out to the public. The evolution of the Smithsonian postcard has three major phases; the Exterior Buildings Period, the Exhibit Collections Period, and the Advertising Period. The first period of Smithsonian postcards is the “Exterior Buildings Period,” which runs from roughly 1898 to 1930. During this time, the main types of images on Smithsonian postcards were exterior views of the Smithsonian buildings—primarily the Smithsonian Institution Building, the Arts and Industries Building, and the National Museum of Natural History. In contrast to later periods, postcards produced during the "Exterior Buildings Period" had little to no information on the message side about the subjects of their images. 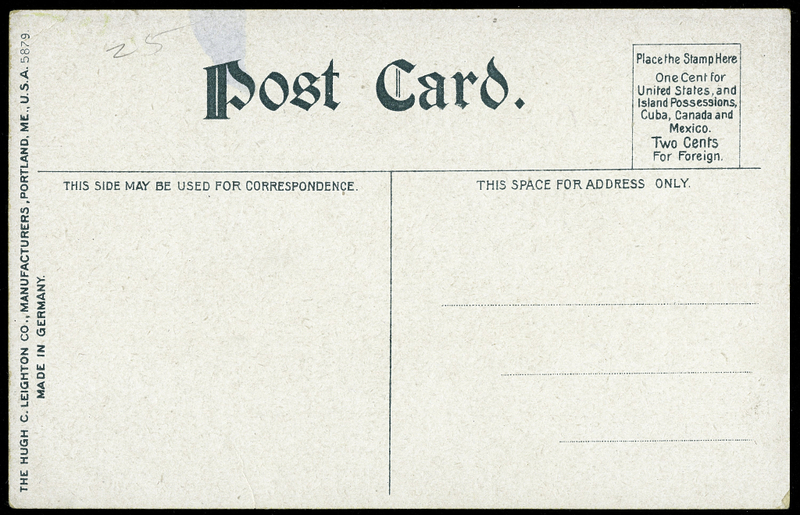 Part of the reason for this lack of information is because until March 1, 1907, the backs of postcards were only allowed to have space for mailing information. Even after March 1907, Smithsonian postcards still did not contain much information, if any, on the message side about the images. The lack of information on the back of postcards also reflects their purpose and usage: during the "Exterior Buildings Period," Smithsonian postcards were used as a means of communication between individuals. Postcards were a quick and easy way to send messages and updates, the same way we use text messaging and social networks like Twitter today. Using postcards as a means of communication between individuals stands in contrast to usage in later periods, when the Smithsonian utilized postcards to reach out to the public. The second period of Smithsonian postcards is the "Exhibit Collections Period," which runs from about 1930 to 1980. 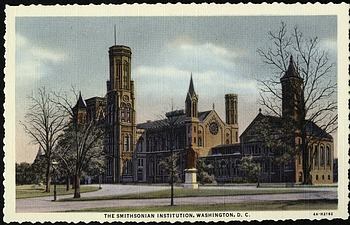 During this period, postcards were still produced with exterior images of Smithsonian buildings. However, postcards with images of objects in the Smithsonian's collections and objects on exhibit are much more prevalent in the Archives' collections. The vast majority of these objects are from the two buildings of the Smithsonian's United States National Museum; the buildings now known as the Arts and Industries Building and the National Museum of Natural History. A great number of postcards from the National Zoological Park were also produced during this period, with each postcard showcasing a different species of animal from the zoo. The zoo postcards were also available as souvenir packets of postcards. Postcards created during the "Exhibit Collections Period" generally contain more printed information on the message side than those produced during the "Exterior Buildings Period." A partial factor in this increase, as mentioned above, was the March 1907 act that allowed the back of postcards to contain more than just an address. Though printed information became more frequent from 1930-1980, the amount of information depended on the producer of the postcard. Cards produced by The Albertype Co. contain paragraphs of printed text about the image on the front of the card, while cards produced by Capitol Souvenir Company generally have only a couple sentences. Cards produced by Curt Teich & Co., in contrast, have little to no printed information on the message side. The change in image types and amount of printed information on the back suggests the Smithsonian’s desire during this period to reach out more to the public. The postcards of objects highlight the Smithsonian's collections and show people the kind of exciting things they could expect to find inside the museums, rather than just the buildings themselves. The objects and included information also displayed the wealth of information available at the Smithsonian to truly meet its mission for the "increase and diffusion of knowledge among men." Though the images and printed information changed on postcards during the "Exhibit Collections Period," the primary function and usage of postcards did not. Postcards remained a quick and convenient way for individuals to communicate. The final period of Smithsonian postcards stretches from 1980 to today: the "Advertising Period." Postcards from this time period continue to display objects from exhibits, but the function and use of these postcards are drastically different from earlier periods. Rather than simply showing the object on display, these postcards overtly advertise and promote the objects and exhibits. The Smithsonian also began to use postcards to encourage membership and museum attendance. For example, many of our postcards from the National Museum of the American Indian (NMAI) include a sub-type of advertising postcards: RSVP postcards. These cards have prepaid postage and were a way for individuals to RSVP to NMAI exhibit events. Because the Smithsonian used these postcards for advertisement purposes, the amount and content of printed information on the message side of postcards is markedly different from that of earlier periods. The backs of almost all of these postcards are filled with printed information about the museums and exhibits they are promoting; content of the exhibit, opening and closing dates of the exhibition, museum operating hours and admission, and other information. The RSVP postcards are simpler, with a space to indicate attendance and number of guests, but they still speak to the promotional nature of the postcards from this period. The shift to promotional postcards during the "Advertising Period" shows how Smithsonian postcards evolved from being a means of communication between private individuals to being a way for the Smithsonian to communicate with the public about upcoming museum exhibits and events. 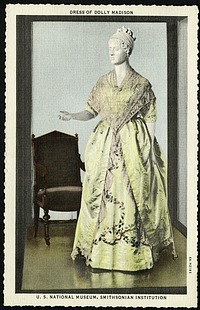 "Postcard History," Smithsonian Institution Archives. Accession T90126: Smithsonian Institution Press, Postcards, 1931, 1956, and undated, Smithsonian Institution Archives. Record Unit 95: Photograph Collection, 1850's, Smithsonian Institution Archives.